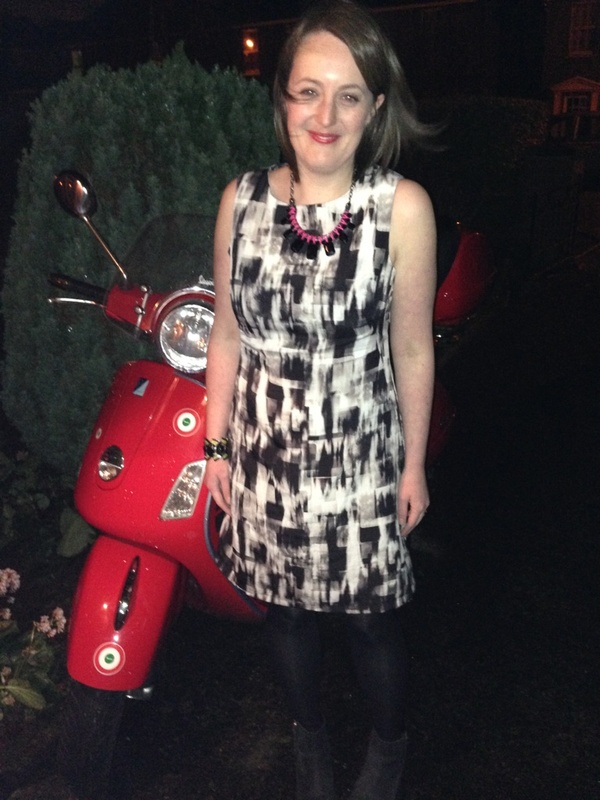 Sinead suggested I add a better background to enhance my patented First Day of School pose so here I am standing beside her Vespa in balmy January in Dublin. Similar to Sinead, I fancied a quick win on the sewing front so I decided to give Simplicity 1609 a go which looks fairly simple (I know, famous last words). The material was part of my Michael H haul from the RDS show. I think it’s viscose, it’s quite fine. I decided against lining the dress due to the aforementioned wanting a quick win, laziness and being able to wear it during the summer (in that order). The dress was indeed very simple to run up. In particular, the way the facing is set up is nice and neat (it’s one of the ones that you pull the dress through the shoulder section). I decided against the seam running down the front so just removed the seam allowance and cut the front in one section. It was only when I was fitting the dress for the zip (and after doing lots of nice understitching) that I realised the neck was uncomfortably high so I modified it to give a slightly lower neck. I ripped the understitching and sewed a new seam at the centre of the neck at the front about an inch lower (and curved to meet the existing neckline seam at the sides) and then cut the excess material. It wasn’t a difficult change and the facing had enough in it that it didn’t have to be redone. The other item of note is that the dress is pretty small fitting. I made it in a 14 and ended up having to let out the side seams. I thought this may have more to do with Christmas chocolate consumption than a small-fitting pattern but it does seem to be the case in other reviews so…. size up! As usual, in my haste to get it finished I had a few zip troubles. Despite using the interfacing trick, I managed to stretch the fabric unequal amounts on each side when sewing in the zip – nightmare. I think it took me 4 goes (and plenty of “sewing Tourettes”) to get it right. But that was it – which is a win in my book! There’s more of a kick out at the end than I expected but I’m really pleased with it and I expect I’ll redo it in other fabrics. I like it! 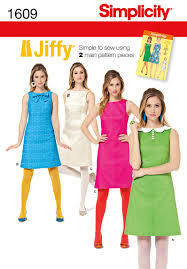 Thumbs up to the Jiffy Dress! Yes, I wear the same accessories with every outfit. This entry was posted in Completed Garments, Simplicity and tagged Simplicity 1609, Zip troubles by Aoife. Bookmark the permalink.